We are excited to be a part of the Chefs Cycle Rooftop BBQ Fundraiser for No Kid Hungry! 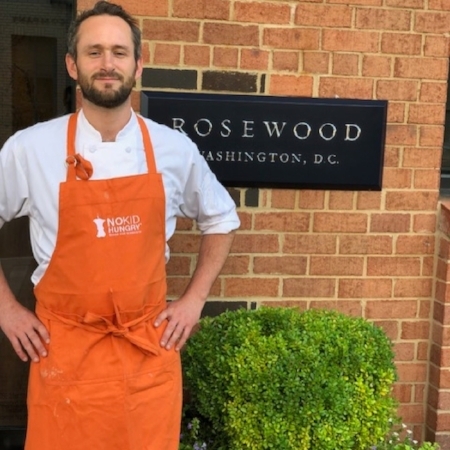 Rosewood Washington, D.C. is sponsoring a special rooftop barbecue hosted in support of Chefs Cycle, a fundraising event benefiting childhood hunger organization No Kid Hungry, on Saturday, September 15th from 5:00 to 8:00 PM. Inspired by Sous Chef Colin Graham, who will participate in the upcoming Charlottesville Fall 2018 Chefs Cycle, the all-you-can-eat barbecue will feature cuisine and cocktails presented with the support of Rosewood Washington, D.C.’s valued partners and purveyors. The evening will also include a silent auction offering items such as indoor cycling classes from boutique fitness studio Soul Cycle. Tickets are priced at $50 per person and limited. Chefs Cycle is a fundraising endurance event featuring award-winning chefs and members of the culinary community fighting hunger outside the kitchen. For the past four years, Chefs Cycle has engaged culinary talents who want to push their limits by completing a three day, 300 mile ride while raising funds and awareness in support of No Kid Hungry. The fall 2018 ride will take place September 25-27 in Charlottesville, VA with a goal of 150 chefs riding to help raise $1.5 million, which translates into 15 million meals for kids facing hunger!! We hope you can join us for a fun evening to support a great cause!